Roundtable – The Role of Media in Conflict Resolution. Oslo, 25-27 April, 2018. 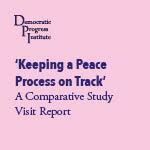 Comparative Study Visit Report: Peace & the Economy – The Role of Business and the Private Sector in Peace Processes. Dublin and Belfast, July 10-13, 2017. DPI held a Roundtable in London with CHP MP Gulseren Onanç discussing the aftermath of the April 2017 constitutional referendum and expectations of changes to come. On 4th March 2017, the Democratic Progress Institute (DPI) held a roundtable in Ankara which brought together a diverse group from Turkey’s political and cultural spectra. DPI assisted with the facilitation of a recent roundtable meeting in Diyarbakir, focusing on comparative learnings from the Philippines’ experience of conflict resolution. Speakers included David Gorman, who has worked extensively on the Philippines peace process among other international peace processes. DPI is extremely sad to learn of the death of Tahir Elci, Head of the Diyarbakir Bar Association in Turkey. Mr Elçi was a valued friend of the Institute and a participant in our activities; our condolences go out to his family, friends and colleagues. DPI Director Kerim Yildiz meets with US Senator George Mitchell to discuss his role of Chair of the Good Friday Agreement during DPI’s Comparative Study Visit to Ireland. This brief considers the application of human rights in the theatre of war. 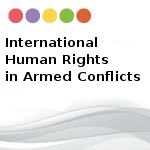 The sources of international human rights law relevant to armed conflict are highlighted and compared with international humanitarian law. In evaluation, the practicalities of implementation of international law are assessed. The Democratic Progress Institute (DPI) in partnership with Istanbul Bilgi University last weekend held a roundtable meeting at Bilgi University in Istanbul, Turkey, on the subject of Language, Media and Identity in Conflict Resolution. The aim of the roundtable was to examine the role of language, media and identity in conflict resolution and democratic advancement. Laurie Nathan, Director of the Centre for Mediation at the University of Pretoria in South Africa and a key actor in the South African process of reconciliation, was met with during DPI’s Comparative Study Visit to South Africa, as part of the Institute’s Turkey Programme. 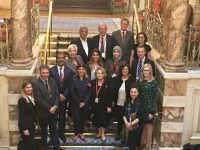 DPI and InterMediate jointly conducted a conflict resolution focused roundtable meeting in Oslo this month with members of Syrian opposition groups. On March 6th, DPI staff and interns commemorated International Women’s Day with film screenings, readings and discussion addressing the experiences of women in conflict zones. The Democratic Progress Institute (DPI) last weekend held a roundtable meeting in Sanliurfa, Turkey, on the subject of the Role of Civil Society in Conflict Resolution. The aim of the roundtable was to broaden bases for dialogue among civil society within Turkey, on the subject of conflict resolution and related topics. 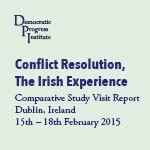 The Democratic Progress Institute and the Welsh Government had this week conducted a jointly organised Comparative Study Visit, that took place from 12 to 16 January 2014 in Wales, United Kingdom. Last week a number of DPI Council of Experts members met with DPI staff at the Merrion Hotel, Dublin, for a Strategy Seminar. Forthcoming DPI activities and research were discussed. The Democratic Progress Institute and Berghof Foundation had this week conducted a jointly organised Comparative Study Visit, that took place from 21 to 24 October 2013 in Berlin, Germany. During this visit, hosted by the Irish Government, participants from Turkey’s BDP party met with key actors from the Irish peace process, to discuss issues relating to conflict resolution. The paper summarizes and analyses the Good Friday Agreement as a centrepiece of the Northern Irish conflict resolution process. 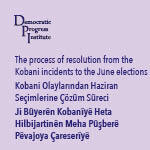 The Democratic Progress Institute (DPI) this weekend held a roundtable meeting at Mardin University, Turkey, on the subject of the relationship between the State and the Media (both local and national), and its effect of this on conflict resolution. DPI Council of Experts member Jonathan Powell speaking at a conference in Diyarbakir, Turkey, in April 2013. Fellow DPI Council of Experts member Cengiz Çandar was moderator of the event. DPI Strategic Retreat – Held at Hintlesham Hall, Ipswich on the 4-5 February 2013. DPI staff, Board of Directors and a number of Council of Experts members spent a two-day Strategic Retreat in Suffolk this month. This paper aims to examine and compare the sources of conflict and processes of negotiation and conflict resolution within the southern Philippines in relation to the communities and insurgent groups in Muslim areas of Mindanao and the Sulu Archipelago. To download the paper as a PDF, please click here. Downloads of all other DPI publications are available here. This paper by Cengiz Çandar, published today, considers two major issues currently faced by Turkey: that of the Kurdish Question and that of the Syrian predicament. 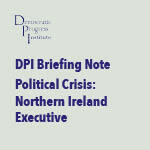 DPI has published two expert research papers which are now available to download via our publications section.